As we know SharePoint 2013 preview has been released, there are certain changes made to SharePoint 2013 compared to SharePoint 2010. Workspace, and Multipage Meeting Workspace under meeting workspace site template. 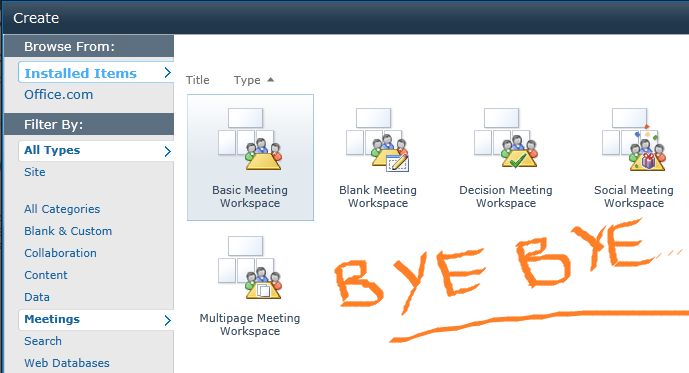 So in SharePoint 2010 none of the meeting workspaces will be available. According to microsoft for meeting related stuffs you can take the help of Office 2013 Preview and SharePoint 2013 Preview to accomplish the task. Like you can use Lync to conduct live meetings, OneNote to take notes during meetings, and a SharePoint team site or My Site to store shared meeting notes. But as always Microsoft has a good migration plan. Existing sites that were created by using the Meeting Workspace site templates will continue to operate in SharePoint 2013 Preview. 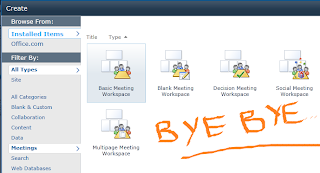 The Meeting Workspace site templates will be removed completely from the next major release of SharePoint and sites that were created by using the Meeting Workspace site templates will not be supported.